Hydroponics and aquaponics are an important part of sustainable agriculture, especially in space-scarce urban areas. Numerous high schools recognize the bright future of hydroponics and aquaponics, and as a result include it as part of their curriculum. At the Bedford Stuyvesant New Beginnings Charter School in Brooklyn, New York, the school using its Urban Farm for service-learning. Through hydroponics, students grow produce year-round, which helps feed people at the school as well as community members. Produce grown includes tomatoes, herbs, peppers and greens. Each month, the farm hosts a market days event to recognize the school’s rich cultural diversity, as well as to promote health and nutrition. The Urban Farm has partnerships with New York Sun Works, City Hydroponics and Teens for Food Justice. A 2-year-old non-rural FFA chapter at Maize High School, located in suburban Wichita, Kansas, grows food hydroponically. Teacher Jay Super recognized that his students were eager to learn about new ways of farming and about where their food comes from, so he applied for a $12,500 grant from the Kansas Department of Agriculture that enables them to grow food for the school’s cafeteria. With the grant money, Maize High purchased hydroponic equipment. Super and his students converted a windowed hallway into a hydroponics farm. Basil, dill and cilantro are used by students in the school’s culinary program, while lettuce, tomatoes, radishes and carrots are served in the cafeteria. Aiea High School in Aiea, Hawaii uses hydroponics to teach about the relationship between math, science and agriculture. Jamie Fujiyama Macadang, a science teacher at the high school, applied for and received a grant from Hawaii Pacific Solar a new hydroponics system. It is used to grow vegetables for farmers’ markets and for the families of students. Hydroponics is also taught in science classes at Aiea, and a student club uses hydroponics to grow native Hawaiian plants. A hydroponics garden sits on the roof of Carlsbad High School in Carlsbad, California. 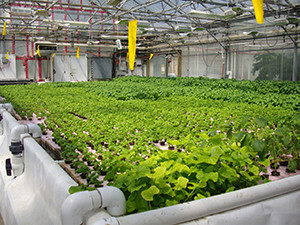 Started by students in the school’s Alternative Energy Organization, the hydroponics system was completed in fall 2010. In addition to providing a steady supply of lettuce, the rooftop hydroponics operation provides hands-on educational opportunities. Science and technology are the focus at Johnson County High School’s greenhouse, hydroponics and aquaponics facilities. The aquaponics operation makes its home in a 9,000-square foot building at the Mountain City, Tennessee school. Tilapia is raised along with hydroponic tomatoes and cucumbers. Lettuce hangs above the water, taking in nitrogen and returning oxygen. The aquaponics and hydroponics facilities provide experiential learning in the subjects of chemistry, math and science. The Island School in The Bahamas attracts high school students from all over the world for semester or summer programs. Sustainability is a core value of the school, which uses its own campus and the nearby ocean as working science laboratories. The school partners with the Cape Eleuthera Institute, and strives to engage in sustainability research that can be put to immediate use. Aquaponics is just one of the school’s sustainability ventures. Aquaponics classes are offered at The Providence School in Wilmore, Kentucky. A grant provided funding for the aquaponics system, but even prior, students were learning the basic concepts of aquaponics with herb gardens and goldfish. Now, waste from tilapia provides nourishment to kale, basil and other plants. Science students built the facility, and they through aquaponics, they learn about cooking, business and gardening. The ultimate goal is to build up a comprehensive sustainable food system. Bourne High School in Bourne, Massachusetts received grant money for an aquaponics laboratory. In the lab, students will learn about aquaponics, hydroponics and ecology as they grow plants and raise fish. Middle school and elementary school students will also have use of the lab, when it is available. Other lab work will center on nitrogen, water quality, genetics and more. Students at Tunstall High School in Dry Fork, Virginia raise tilapia in their aquaponics facility. The program emphasizes innovative technology and training, and provides hands-on and experiential learning opportunities. Science and agriculture theory come to life as real-world learning when the students see how aquaponics works firsthand, and traditional college-prep courses such as science are melded with vocational education. All aquaponics students must be either a junior or senior, and prerequisites are biology and algebra. The high school works with Blue Ridge Aquaculture and Virginia Cooperative Extension. The aquaponics program at Cincinnati Hills Christian Academy in Cincinnati, Ohio unofficially started in 2011, when students in a science class put a 65-gallon aquarium to use, along with empty soda bottles and shale media. Begun as part of the agriculture and food systems curriculum, the original system has been a prolific producer of food, including hot and bell peppers, lemon balm, greens, basil and kale. Subsequent systems have been constructed, using a variety of fish (perch, catfish and bluegill). Aquaponics is introduced in freshman biology and sophomore chemistry.